The user management module is the place where you can edit your own information, such as company name or credentials, and also create new logins for colleagues. This is also where access rights to accounts can be managed. We distinguish between 'users', 'accounts' and 'companies'. This may seem complicated, but each has a purpose. We will explain them more in-depth now. Most of the time an SMTPeter account is used by one company. In this case your 'company' is equal to your company name. However, the SMTPeter company with the license might send email for multiple companies. In this case it is useful to create an account for each company the licensed company sends email for. To each account you can add users that are allowed to access it. There are different permissions. If you send email for different companies you can add users with viewing permission, such that the companies can monitor the email you sent for them. It's also possible for companies that send their own email to add a user, for example to give an external specialist access to the software and data. 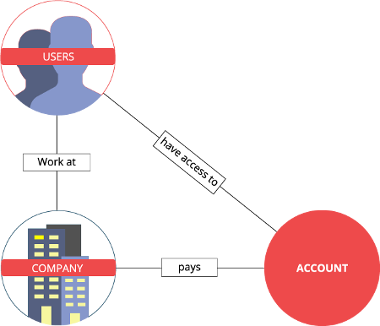 The triangle below illustrates the relation between 'company', 'account' and 'user'. The triangular relationship as pictured above makes it possible to grant different sorts of access to accounts. In the user dashboard you can create these types of relations to your liking, depending on your access rights. The SMTPeter application has an account management section where you can manage users, accounts and company information. If you're a regular user, i.e. a single account with a few colleagues, this may look a little superfluous: you have a list of colleagues and a list of people with access to the account, while these are often the same list. As described, this is because of the triangular structure, which you can use in the case of multiple accounts, or if you want to grant access to a non-colleague.